KUALA LUMPUR (Dec 10): Some Umno delegates see it as unfair that party president Datuk Seri Najib Razak openly attacked his critics and denied them a chance to reply, following the decision to ban deputy president Tan Sri Muhyiddin Yassin from speaking at the party's annual general assembly. Najib today reminded Muhyiddin that his duty was to assist the president in his duties. He also directed the same reminder to party vice-president Datuk Seri Shafie Apdal in his opening speech at the Umno general assembly today. 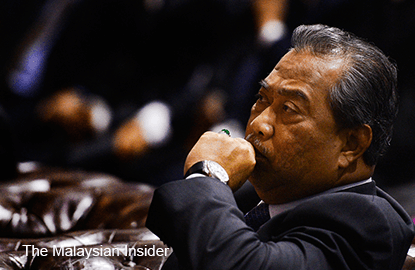 "Tan Sri Muhyiddin is not allowed to give a speech, how is he going to defend himself?" asked a delegate from Selangor, Mohd Hamidi Abu Bakar. The Umno Supreme Council decided to bar Muhyiddin, who was dropped from Cabinet as deputy prime minister in July, from officiating the party's wing meetings this year. The council also barred Shafie from speaking, a departure from past practice. Shafie was dropped from Cabinet along with Muhyiddin for openly criticising Najib. Hamidi said he was also disappointed that Muhyiddin's name together with former Umno president Tun Dr Mahathir Mohamad, considered a father figure by grassroots members, received no mention in the hall. "Even Tun M (Dr Mahathir) was not mentioned... what is this?" An Umno member from Sepang, Rushdan Mohamed, said Najib should not stop other party leaders from speaking. “He asks people to speak up, but when they do, he shuts their mouths. “I am more worried now about what the people are saying,” said Rushdan who heads the Umno Rista Villa Perdana branch. Another grassroots member, Kamarul Azman Habibur Rahman, described Najib has having lost his focus on advancing the Malay community and becoming obsessed with staying in power. “It is clear from his speech that he has lost focus on what needs to be done to develop the Malays. “The assembly should be used as a platform to resolve Umno's challenges, but his speech has made things more complex. “He is too focused on his survival as a leader instead of giving attention to how Umno will face the 14th general election,” Kamarul Azman said. Kamarul Azman, who is part of the faction of party branch chiefs opposed to Najib, says he feels the president is taking a step backwards in preventing his critics from speaking, even while launching attacks against them. Only Najib will be delivering the winding up address at the end of the assembly this time. “Attacking other leaders and not giving them a chance to speak can be considered a regressive move. “Those who are sympathetic towards these leaders who have been prevented from speaking will feel even more convinced that Najib is the one who has gone overboard. “I hope Najib can set aside these issues and focus on the progress of the Malays intend,” he said.